Seven years into the development process and it’s still not known how ICD-11 intends to classify the three G93.3 terms. 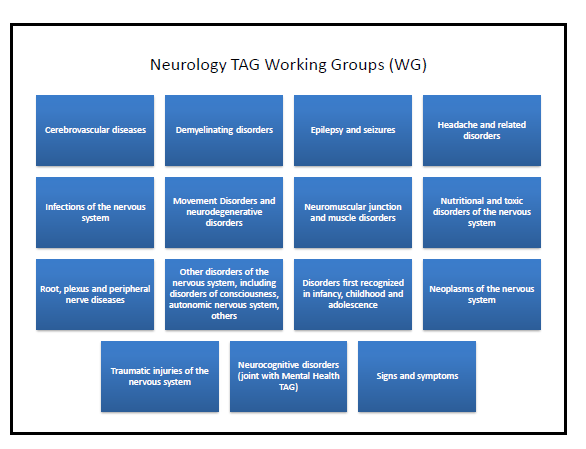 Sub working groups were formed under TAG Neurology with responsibility for the restructured disease and disorder blocks proposed for ICD-11’s Diseases of the nervous system chapter. It hasn’t been established which of the various sub working groups has responsibility for making recommendations for the revision of the G93.3 terms or who the members of the subgroup(s) and its external advisers are. No journal papers, editorials, presentations or public domain progress reports have been published, to date, on behalf of TAG Neurology that discuss emerging proposals or intentions for the classification of the three G93.3 terms for ICD-11. The public version of the Beta drafting platform displays no editing change histories or category notes. Until the three terms have been restored to the Beta draft the public is reliant on what information WHO/ICD Revision chooses to disclose, which thus far, has been minimal. Currently, there is no information within the Beta draft for proposals for these three terms. The continued absence of these terms from the draft (now missing for over 18 months) is hampering professional and public stakeholder scrutiny, discourse and comment. This is not acceptable for any disease category given that ICD Revision is being promoted by WHO’s, Bedirhan Üstün, as an open and transparent process and inclusive of stakeholders. This next section summarizes the most significant changes since May 2010 for several iterations of the Neurology chapter, during the Alpha and Beta drafting phases, as displayed in the public version of the draft. 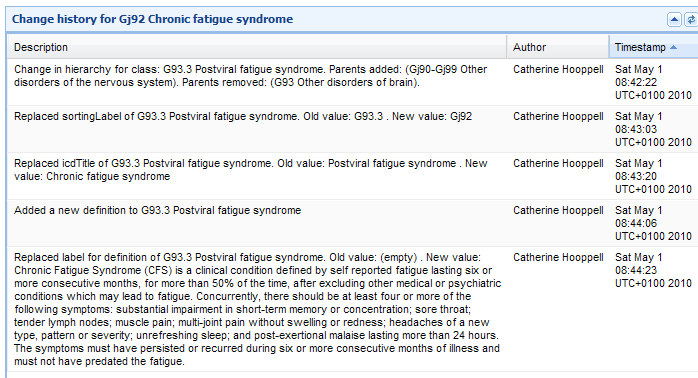 In May 2010: the ICD-10 G93 legacy parent class: Other disorders of brain was retired and a change in hierarchy for class Postviral fatigue syndrome recorded. See Notes Tree screenshot . A Definition was inserted for Chronic fatigue syndrome. See Change history screenshot . Chronic fatigue syndrome replaced Postviral fatigue syndrome as the new ICD Title term and now sat directly under parent class: Other disorders of the nervous system. Benign myalgic encephalomyelitis was specified as an Inclusion term under Synonyms to new ICD Title term: Chronic fatigue syndrome. See Alpha draft screenshot . Postviral fatigue syndrome was at that point unaccounted for in the Alpha draft. By July 2012: 13 additional terms were now listed under Synonyms, including Postviral fatigue syndrome, and two terms imported from the yet to be implemented, ICD-10-CM (the ICD-10-CM Chapter 18 R53.82 codes: chronic fatigue syndrome nos and chronic fatigue, unspecified). The Definition field was now blanked. At this point, ICD Title term: Chronic fatigue syndrome was no longer displaying as a child category directly under parent class: Other disorders of the nervous system. The listing for Chronic fatigue syndrome now appeared under a new “Selected Cause” subset, which displayed as a sub linearization within the Foundation Component. The purpose of this subset, which aggregated many terms from Neurology and other chapters, was not evident from the Beta draft. Below is a screenshot from the Beta draft taken in July 2012, before a Definition for Title term, Chronic fatigue syndrome had been re-inserted. Source: ICD-11 Beta drafting platform, July 25, 2012. This “Selected Cause” sub linearization was later removed from the public Beta draft and some of the terms that had been listed under it were restored to the Neurology chapter and to other chapters. But ICD Title term, Chronic fatigue syndrome, its Inclusion term and list of Synonyms were not restored to any chapter. Since February 2013: no listing can be found in any chapter of the public version of the Beta draft, under any linearization, for any of the terms, Postviral fatigue syndrome, Benign myalgic encephalomyelitis or Chronic fatigue syndrome, as uniquely coded ICD Title terms, or as Inclusion terms or Synonyms to Title terms, or in the ICD-11 Beta Index. Since June 2013: My repeated requests for an explanation for the absence of these three terms from the Beta draft and for ICD Revision’s intentions for these terms were ignored by ICD Revision until July 2014, when a response was forthcoming from ICD Revision’s, Dr Geoffrey Reed. What clarifications have been given? Feb 12, 2014: An unidentified admin for the @WHO Twitter account replied to a member of the public: “Fibromyalgia, ME/CFS are not included as Mental & Behavioural Disorders in ICD-10, there is no proposal to do so for ICD-11.” A similar affirmation was tweeted by Gregory Hartl, head of public relations/social media, WHO. Dr Reed stated inter alia that the placement of ME and related conditions within the broader classification is still unresolved. That he had no influence or control over this process; his authority being limited to coordinating recommendations related to conditions that should or should not be placed in the chapter on Mental and behavioural disorders. That there has been no proposal and no intention to include ME or other conditions such as fibromyalgia* or chronic fatigue syndrome in the classification of mental disorders. That since his purview does not extend to the section on classification of Diseases of the nervous system or other areas outside the Mental and behavioural disorders chapter, he was unable to provide any information related to how these conditions will be classified in other chapters. That he was unable to comment about the management of correspondence by other TAG groups and signposted me to Dr Robert Jakob [the senior classification expert who had been copied into the joint organizations’ letter to WHO/ICD Revision, in March] whose role relates to the overall coordination of the classification. *Fibromyalgia remains classified under ICD-11 Beta draft public version chapter “Diseases of the musculoskeletal system and connective tissue” under parent: Certain specified soft tissue disorders, not elsewhere classified. Irritable bowel syndrome remains classified under ICD-11 Beta draft public version chapter “Diseases of the digestive system” under: Functional gastrointestinal disorders > Irritable bowel syndrome and certain specified functional bowel disorders. In August, I submitted two FOI requests, one to the Scottish Health Directorate, one to the English Department of Health. The latter was not deemed specific enough in terms of named health agencies for a response to be generated and will require resubmission. Under the Freedom of Information (Scotland) Act 2002, please provide the following. I also request copies of responses received from WHO in reply to enquiries made by Scottish Health Directorate during these periods in respect of the above ICD disease categories. Information held covering the time period indicated relates to an email exchange on 11 and 12 March 2014 as part of a request for advice in answering Ministerial correspondence. On 11 March the World Health Organisation WHO were asked “I would be very grateful for your help in confirming the status of an element within the WHO’s ICD 11 regarding ME/CFS. On 25th February in the UK parliament, the Under-Secretary of State for Health informed the UK parliament that the WHO had publicy stated that there was no proposal to reclassify ME/CFS in ICD-11…I would be very grateful if you can confirm that this is the case and if possible, provide a web link to the original wording so I can include this within the correspondence I am preparing”. The WHO responded on 12 March; “The question regarding MS/CFS [sic] and ICD-11 has been asked recently by several different parties. At this point in time, the ICD-11 is still under development, and to handle this classification issue we will need more time and input from the relevant working groups. It would be premature to make any statement on the subject below. The general information on ICD Revision can be accessed here: http://www.who.int/classifications/icd/revision/. The current state of development of ICD-11 (draft) can be viewed here (and comments can be made, after self registration): http://www.who.int/classifications/icd11 ”. A further email on 12 March to the WHO asked; “It would be fair to say then …that work will continue on the draft with an expected publication in 2015?”. *Since the three terms are currently not accounted for within the Beta draft this impedes the submission of comments. This is the sum total of what has been disclosed by WHO/ICD Revision in respect of current proposals for the classification of the three ICD-10 G93.3 terms, despite the fact that ICD-11 has now been under development for 7 years, and prior to the timeline extension in January 2014, the new edition had been scheduled for WHA approval and dissemination in 2015. What might the working group potentially be considering? TAG Neurology may be proposing to retain all three terms under the Neurology chapter, under an existing parent class that is still under reorganization, and has taken the three terms out of the linearizations in the meantime, or is proposing to locate one or more of the terms under a new parent class for which a name and location has yet to be agreed. TAG Neurology may be proposing to locate one or more of these terms under more than one chapter, for example, under the Neurology chapter but dual parented under the Symptoms and signs chapter. Or multi parented and viewable under a multisystem linearization, if the potential for a multisystem linearization remains under discussion. TAG Neurology may be proposing to retire one or more of these three terms (despite earlier assurances by senior WHO classification experts) but I think this unlikely. ICD-11 will be integrable with SNOMED CT, which includes all three terms, albeit with ME and BME listed as synonyms to coded CFS, with PVFS assigned a discrete SNOMED CT code. Given the extension to the timeline, TAG Neurology may be reluctant to make decisions at this point because it has been made aware of the HHS contract with U.S. Institute of Medicine (IOM) to develop “evidence-based clinical diagnostic criteria for ME/CFS” and to “recommend whether new terminology for ME/CFS should be adopted.” Any new resulting criteria or terminology might potentially be used to inform ICD-11 decisions. Other possibilities might be listing one or more of these terms under parent class, Certain specified disorders of the nervous system or under Symptoms, signs and clinical findings involving the nervous system, which is dual parented under both the Neurology chapter and the Symptoms and signs chapter. Click on the small grey arrows next to Beta draft categories to display their parent, child and grandchildren categories, as drop down hierarchies. Select this coloured button to display symbols and hover text indicating which linearization(s) a selected term is listed under. There is a new parent class proposed for the ICD-11 Neurology chapter called, Functional clinical forms of the nervous system, which Dr Jon Stone has been working on  . Under this new Neurology chapter parent class, it is proposed to relocate or dual locate a list of “functional disorders” (Functional paralysis or weakness; Functional sensory disorder; Functional movement disorder; Functional gait disorder; Functional cognitive disorder etc.) which in ICD-10 are classified under the Chapter V Dissociative [conversion] disorders section. The rationale for this proposed chapter shift for Conversion disorders/functional disorders is beyond the scope of this briefing paper. In a 2013 editorial, Prof Raad Shakir (Chair, TAG Neurology) briefly discusses the proposed reorganization of what he calls the “rag bag of diverse and disparate diseases” that is parent class, Other disorders of the nervous system . It’s not clear whether this reference, in 2013, to the inclusion of a new section for “Functional disorders of the nervous system” within the Neurology chapter relates to the relocation or dual location of those “functional disorders” currently classified under Dissociative [conversion] disorders within ICD-10 Chapter V, or whether Prof Shakir was referring to potential inclusion within the Neurology chapter of a section for “Functional somatic syndromes.” But I consider the former more likely. There is currently no inclusion within any chapter for a specific parent class for “Functional somatic syndromes,” or “Functional somatic disorders” or “interface disorders” under which, conceivably, those who consider CFS, ME, IBS and FM to be “speciality driven” manifestations of a similar underlying functional disorder might be keen to see these terms aggregated. I shall return to the subject of “interface disorders” in Part 3. • under which chapter(s) are PVFS, BME and CFS proposed to be located? • under which parent classes? • what hierarchies are proposed, in terms of coded Title terms, Inclusions, Synonyms? • which of the terms are to be assigned definitions? • where will definitions be sourced from? • when will the terms be restored to the draft to enable scrutiny and comment? Having obscured these terms from the Beta drafting platform eighteen months ago, with no explanation, ICD Revision Steering Group and TAG Neurology, which are both accountable to WHO, have disenfranchised professional and advocacy stakeholders from scrutiny of, and participation in what is being touted as an open and transparent process. In Part 3, I shall be setting out what is currently known about the status of proposals for the revision of ICD-10’s Somatoform disorders for the core and primary care versions of ICD-11. Important caveats: The public Beta platform is not a static document, it is a work in progress, subject to daily editing and revision, to field test evaluation and to approval by the RSG and WHO classification experts. Not all new proposals may survive the ICD-11 field tests. Chapter numbering, codes and “sorting codes” currently assigned to ICD categories are not stable and will change as chapters and parent/child hierarchies are reorganized. The public version of the Beta is incomplete; not all “Content Model” parameters display or are populated; the draft may contain errors and omissions. The revision of ICD-10 and development of the structure for ICD-11 began in April 2007. ICD-11 was originally planned for completion by 2012, but the timeline was extended to 2015 early in the development process. In January 2014, WHO/ICD Revision extended the timeline by a further two years to allow more time for generation of content, peer review, field testing and evaluation, translations and transition preparations . The current projected date for approval by the World Health Assembly (WHA) is May 2017 with implementation timelined for 2018+. In July 2014, WHO issued a call for expressions of interest in a contract for an external interim assessment of the revision process. Due date for the assessment report is December 15, 2014. It is not known whether WHO intends to publish a summary of the external assessment report. Once ICD-11 is ready for dissemination, WHO Member States will transition to the new edition at their own pace. There is no WHO mandated date by which ICD-11 must be implemented, but WHO has said that it won’t support the annual updating of ICD-10 indefinitely. 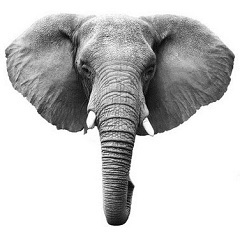 Developing and low resource countries may take many years before migrating to ICD-11. The scope of the revision project is ambitious and technically very complex. The project is under-resourced and underfunded and there is no overall project manager. Work groups have complained about the burden of work and poor internal communications. There will be an ICD-11 print edition and a more expansive computerized version planned to be integrable with the international SNOMED CT terminology system. From the Foundation Component, subsets (known as “linearizations”) are derived that contain mutually exclusive lists of terms for different purposes, e.g. for mortality, morbidity or primary care. There are anticipated to be linearizations for mental and behavioural disorders, low resource and high resource primary care settings, rare diseases and occupational health and speciality classifications, including neurology, paediatrics, ophthalmology and dermatology. The public version of the Beta drafting platform currently displays only the Foundation Component and a Joint Linearization for Mortality and Morbidity Statistics. The country specific “Clinical Modifications” of ICD-10, including the U.S.’s forthcoming ICD-10-CM, are expected to be incorporated into ICD-11, as linearizations, as is ICPC-2. The development process is overseen by a Revision Steering Group (RSG) chaired by biomedical informatics expert, Christopher Chute, MD, Mayo Clinic, Rochester, MN . ICD-10 PHC (sometimes written as ICD-10-PHC or ICD10-PHC or ICD-10 PC), is a simplified version of the WHO’s ICD-10 chapter for mental and behavioural disorders for use in general practice and primary health care settings. This system has rough but not exact equivalence to mental disorders in the core ICD-10 classification. The ICD-10 PHC describes 25 disorders commonly managed within primary care as opposed to circa 450 classified within Chapter V of ICD-10. An revised version, known as ICD-11 PHC, is being developed simultaneously with the core version. The ICD-11 Primary Care Consultation Group, chaired by Prof Sir David Goldberg, is charged with the revision of the 26 mental and behavioural disorders in ICD-10 PHC. The 28 mental disorders proposed for the new primary care edition (ICD-11 PHC) will require an equivalent category within the core ICD-11 version . Over 20 work groups have been assembled since 2007 reporting to the RSG. These are known as Topic Advisory Groups (TAGs). Professional and scientific organisations also have representatives on the TAGs . TAG Managing Editors may also recruit external reviewers for reviewing proposals and textual content. Terms of Reference for TAGs and work groups can be viewed in reference . Reporting to the TAGs are sub working groups charged with making recommendations for specific chapter sections. TAG membership lists are available from the WHO site but the names of sub working group members and external reviewers are not posted. TAG Neurology (Diseases of the nervous system) Chair: Prof Raad Shakir, Managing editor: Tarun Dua, WHO. TAG Mental Health (Mental and behavioural disorders) Co-Chairs: Geoffrey Reed, PhD, WHO; Steven Hyman, MD, Harvard University. ICD-11 Expert Working Group on Somatic Distress and Dissociative Disorders (S3DWG) Chair: Prof Oye Gureje. A sub working group to TAG Mental Health. Prof emeritus, Francis Creed, is a member. This group is said to have 17 members but apart from two others, I have been unable to establish the full membership list. ICD-11 Primary Care Consultation Group (PCCG) Chair: Prof Sir David Goldberg, Vice-chair: Prof Michael Klinkman (U.S.). Per Fink’s research collaborator, Marianne Rosendal, is a member of the 12 person, PCCG. The full member list has been published in a journal paper  but is not posted on the WHO website. There are significant differences between the structure of ICD-10 and ICD-11: more chapters (currently 26 against ICD-10’s 22); reordering of chapters; restructuring of disease classes and parent/child hierarchies within chapters; renaming of some terms; relocation of some terms to other existing chapters or to new chapters; multiple linearizations; more descriptive content; a new system of code numbers. Disease terms with an equivalent ICD-10 term are back referenced to their legacy terms and codes in the electronic platform for ICD-10 Version: 2010 . For ICD-10 Tabular List, an ICD entity (a parent class, title term or inclusion term) can appear in only one place within the classification. For ICD-11, multiple parentage is permissible. In the Foundation Component, disorder or disease terms can appear under more than one hierarchical parent . Diseases that straddle two chapters, like malignant neoplasms of the skin, can now be viewed under Diseases of the skin as well as cross-linking to the Neoplasms chapter. Premenstrual Dysphoric Disorder (PMDD), proposed for inclusion in ICD-11, is listed under both Depressive disorders, in the Mental and behavioural disorders chapter, and also under Premenstrual tension syndrome under new chapter, Conditions related to sexual health. So the ICD-10 concept of discrete chapter location is being dispensed with for ICD-11. In 2010, the Revision Steering Group posted a discussion paper on the potential for incorporating a new chapter into ICD-11 for Multisystem diseases, but this proposal has been rejected . In 2013, consideration was being given, instead, for generating a multisystem diseases linearization – as a virtual chapter – compiled from the Foundation Component that lists all ICD disorders and diseases, but there would be no separate Multisystem diseases chapter within the print version . It isn’t known whether a decision has been reached but there is currently no ability to generate a multisystem diseases linearization from the Foundation Component, at least not within the public version of the Beta drafting platform. How to represent multisystem diseases within ICD-11 (and the potential for an ICD category term to be assigned to multiple parents) could have implications for classification of one or more of the three ICD-10 G93.3 terms. Another major difference between ICD-10 and ICD-11 is the Content Model. For ICD-11, all uniquely coded ICD Title terms (but not their Inclusion terms or Synonyms) are intended to have Definitions and in some cases, other descriptive content populated . Whereas category terms located in ICD-10 chapters other than Chapter V: Mental and behavioural disorders were listed, to quote WHO’s, Bedirhan Üstün, like a laundry list, with no descriptive content. Outside of the WHO classification experts, the RSG, the working groups, sub working groups and their external advisers who else is inputting into the development process? In 2009, ICD Revision Steering Group began inviting professional bodies and Royal Colleges to submit proposals for revisions to the ICD structure and content for ICD-11. WHO has also set up a Global Clinical Practice Network (GCPN), an international network of over 11,000 mental health and primary care professionals . Medicine; Nursing; Midwifery; Dentistry; Pharmacy; Health information management (coding, medical records); Environmental and occupational health and hygiene; Physiotherapy or Physical therapy; Nutrition; Social Sciences; Psychology; Social work and counseling; Epidemiology; Health Policy; Traditional and complementary medicine. A pre-final draft for ICD-11 is expected to be released for public comment at some point in 2015/16, but no firm date for this has been announced. Professional stakeholders and others who register an interest are able to interact with the Beta drafting platform and access additional content, e.g. PDFs of the print versions and Index. The public version of the Beta drafting platform can be viewed without registration but comments submitted by registered stakeholders are not visible to non registered viewers. Comments and suggestions are screened and forwarded to the appropriate TAG Managing editors for review. Occasionally, a TAG Managing editor or one of the ICD Revision staff will respond to a proposal or a request for correction via the comments facility. The Beta platform is intended for considered and collegiate input – not as a platform for campaigning or activism. Some patient advocacy organisations, for example, gender and trans* groups, have been holding face to face meetings with ICD Revision personnel at conferences or other venues to inform the revision process and represent their constituencies’ interests. A new Proposals mechanism was launched on the public Beta draft in July 2014. This is a more sophisticated system through which registered users can submit proposals, supported with rationales and references, for changes/additions/deletions to proposed ICD-11 entities. ICD Revision and TAG Managing editors are developing the Beta draft on a separate electronic multi-authoring platform, known as the iCAT, on a server which is not accessible to the public. The iCAT Beta platform is more layered than the Beta version which the public sees: it displays a larger number of “Content Model” parameters; there are tabs for tracking “Change Histories” and “Category Notes and Discussions” for comparing earlier iterations of a specific chapter section with the most recent edits. There are sub lists for terms that are proposed to be retired or for which decisions are needing to be made. The public version of the Beta has no means through which changes to the draft (and rationales for changes) can be tracked, or for comparing, for example, an earlier edit of a specific chapter section with the most recent content. The inability to monitor editing histories in the public Beta draft and the absence of progress reports from the work groups adds to confusion around interpretation of the Beta content. The draft is updated daily, so it needs checking every day for relevant changes. Click on the small grey arrows next to the Beta draft categories to display their parent, child and grandchildren categories, as drop down hierarchies. The display panel on the right contains the “Content Model” text: Short and Long Definitions, Inclusion terms, Synonyms, Exclusions, Index terms etc. for the selected ICD Title term. Many terms are still awaiting population of Short Definitions (for print version) and Long Definitions (for electronic version), and other descriptive content. For comparison between the public Beta draft and the iCAT, view this 2 minute iCAT screencast animation (with audio), intended as a demo for ICD Revision editors. In Part Two, I shall be setting out what is currently known about proposals for the classification of Postviral fatigue syndrome, Benign myalgic encephalomyelitis and Chronic fatigue syndrome for ICD-11. Information in this report relates to the World Health Organization’s ICD-11, currently under development. It does not apply to the current ICD version (ICD-10) or to the forthcoming US specific “clinical modification” of ICD-10, known as ICD-10-CM. Documents posted recently by the World Health Organization (WHO) indicate that ICD Revision is failing to meet development targets and a further extension to the ICD-11 timeline is under consideration. ICD serves as the international health information standard for the collection, classification, processing and presentation of disease-related data in national and global health statistics. The 10th edition (ICD-10) was adopted by the World Health Assembly in 1990. The development process for the next edition (ICD-11) began in April 2007, with ICD-11 scheduled for dissemination by 2012 and the timelines for the development of ICD-11 and DSM-5 running more or less in parallel  . Early on in the revision process, the ICD-11 dissemination date was extended. By 2009, the final draft was scheduled for World Health Assembly (WHA) approval in 2014. In order to be ready for global implementation in 2015, the technical work on ICD-11 would need to be completed by 2012 . The WHA approval date was subsequently shunted from 2014 to 2015 – four years later than originally planned and the current, projected implementation date is 2016+. ICD-11 is a very ambitious and under-resourced project. Given the scale of the undertaking, the technical complexity, the limited funding and human resources, the feasibility of the project reaching its targets by May 2015 has proved unrealistic. I have written a number of times on this site that I did not envisage dissemination of ICD-11 by 2016 without some scaling back of the project’s scope – or an announcement, at some point this year, of a further extension to the timeline. WHO has recently posted a meeting materials document  and a slide presentation  which summarize, inter alia, ICD-11’s progress, current development status and timelines for finalization date and approval by WHO Governing Bodies. ICD Revision is considering extending the timeline by up to a couple of years. (v) Preparations for transitions from ICD‐10 to ICD‐11. If WHO/ICD-11 Revision Steering Group does elect to postpone submission for WHA approval until May 2017, dissemination of ICD-11 may not be scheduled before 2018. Once approved and released, adoption of ICD-11 won’t happen overnight. It may take several years before WHO Member States adopt ICD-11. Low resource and developing countries may also take longer to prepare for and transition to the new edition. This projection, in early 2009, would have been based on the assumption that ICD-11 was anticipated to be finalized and submitted for WHA Approval by 2014 (now potentially shifting to 2017). An additional two year delay in the finalization of the ICD-11 code sets would likely impact on the development process for a clinical modification of ICD-11 for US specific use, kicking adaptation and implementation of an ICD-11-CM even further down the road. 3. Dr Geoffrey Reed, Ph.D., May 2009, personal correspondence. 4. Closing remarks, PowerPoint presentation: “Proposal for the ICD Beta Platform”, Stanford team, 12.04.11, WHO, Geneva. 7. DHSS Office of Secretary Final Rule document (Federal Register / Vol. 74, No. 11 / Friday, January 16, 2009 / Rules and Regulations), Page 3332.